LOCATION: This home is less than 50 steps from the beach access and walking distance to Grayton's local dining, such as The Red Bar and Chiringo. DETAILS: DETAILS: "Bella Waves" is a beautiful, brand new spacious home located in the lively community of Grayton Beach! With designer furnishings throughout, a beautiful, open layout, private second-story heated pool, and incredible Gulf views with over 2,000 square feet of outdoor space, you'll enjoy every detail of this luxurious beach vacation home! 6 bedrooms, including two masters, and 8.5 baths provide ample space for 20 guests to sleep comfortably. Enjoy "Bella Waves" high-end features such as reclaimed antique oak floors, marble baths, shiplap walls and ceilings, top-of-the-line appliances and 3 washer/dryer sets and an elevator that services all floors for your convenience. Spend your days with your toes in the sand, just 50 steps from the property and at night enjoy the laid back, vibrant community of Grayton Beach, with it's fabulous local dining and shops nearby! 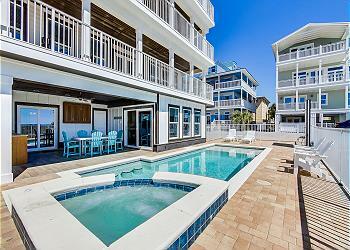 If you enjoy the exciting nightlife of 30A, this is the property for you! Book direct with 360 Blue today and come enjoy this extraordinary vacation home! AMENITIES INCLUDE: 6 adult bikes provided, gulf views, private pool. This property comes with 6 dedicated parking spots. Complete Clean Linen Participant - ALL linens, including comforters laundered upon every checkout. We are a group of twelve friends who have enjoyed traveling together since our children were small. We have always enjoyed the quiet and picturesque beaches and towns along 30-A for our annual girl’s getaway weekend. Although we have stayed at many lovely houses, Bella Waves is by far one of our favorites. It’s lovely decor, spacious conversational areas and incredible gulf views are perfect for a relaxing time. We are already planning next year’s trip, and this house is at the top of our list! We are so pleased that we were able to host your annual girls getaway and we are thrilled that you all enjoyed your stay in Bella Waves! The photo you shared is priceless and shows that there were tons of memories made during this trip! Thank you for staying with 360 Blue, we hope to see you all again soon! I rented Bella Waves for a women's retreat for 20 ladies. This house was even better than the pictures show. The view and location was incredible. The furnishings and decor were out of the pages of a magazine. We loved our stay and the 360 Blue team were very helpful with any questions we had during our stay. Could not recommend this house more! We will definitely be back! 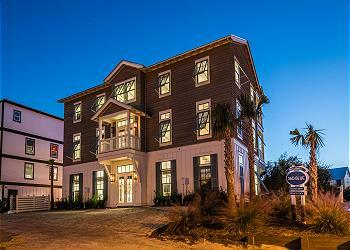 We are so thrilled that you all enjoyed your stay with us in Grayton Beach! We completely agree that this home is the perfect spot to get together and make lasting memories, and between the location and accommodations, it's a tough one to beat! Thank you for staying with 360 Blue, we hope to see you again soon! We had an AMAZING time at Bella Waves! What an awesome location and well thought out home. The heated pool was a major hit, must have for December. Our annual family gathering was exceeded by everything this lovely home has to offer. Kudos to the owner for providing a shuffleboard and Xbox with games for the kiddos! 3 sets of washers and dryers was VERY nice for multiple families too. Beautiful finishes and well stocked kitchen were another plus. We\'ll be staying here again! We are so thrilled that you and your family enjoyed your Winter getaway with us on Grayton Beach! We agree that this home is perfect for multiple families and has so much to offer everyone so no one gets bored! Thank you for staying with 360 Blue, we hope to see you again soon! We loved the house! Tons of space for everyone to hang out. Loved the pool, huge kitchen and game room. Would definitely recommend! We housed the our family for our wedding and had a blast there! We are so thrilled that you enjoyed your vacation with us in Grayton Beach! We agree that this home is the perfect option to accommodate larger groups and families and the added bonus of a game room makes for a fun-filled getaway! Congratulations on your wedding! We are so pleased that you chose 360 Blue to host you all and we hope to do so again very soon! We are so delighted that we were able to host you all for such a happy occasion! We agree that this home is perfect for larger groups and families and the location is wonderful! Thank you for staying with 360 Blue, we look forward to seeing you again soon! Wow! What a wonderful trip to Grayton Beach! We came for a girls' trip (mom-cation) and had a blast. We had 15 people and there was plenty of room for us to spread out. The house was gorgeous!!! You can tell every detail of the house was well thought out...from the laundry rooms to the amount of bathrooms to the high ceilings that made everything seem so open...it was all so perfect. The location could not have been better...right in the middle of everything. The one and only suggestion is for the beach chairs to be set up a little more spread apart from other houses' chairs. The beach is so huge, and it felt like we were all on top of each other. Great trip and we would love to come back! We are so glad that you enjoyed your vacation with us in Grayton Beach! We could not agree more that this home and location are spectacular! It is definitely a great option for larger groups and families! In regards to the beach chairs, our vendors are only able to set chairs up in certain areas of the beach and only have so much space allotted to them due to Florida State Laws. We do hope to see you all again soon! What a great place to stay. We had 4 families staying in the house and had plenty of room. The whole house was built to accommodate a guests every need. An elevator to the 3rd floor. A large ice maker for your cooler, 6 washers and dryers, a great sound system. The pool looks small in the picture but was a good size we had 8 kids and 2 adults in it at one point and had plenty of room for more. The decks were great places to hang out after dinner. The third deck was very large and with the speaker system we were able to play some great music and enjoy the view of the water. A special note to 360 and all their staff what a great company. We had an issue with a hornets nest and they were out faster than Jimmy Johns delivery to take care of it. We had an issue with the air and they were there in about 20 min to correct the issue. First class service from 360 Blue. I have been to many properties, but this is the first time I could really write a review for both excellence in the home and the property. We could not be more thrilled to hear how much you enjoyed your vacation with us in Grayton Beach! We agree that this home is perfect for large groups and everything from the pool, to the view, to the balconies, this home has it all! We are so pleased that you had a great experience with everyone here at 360 Blue and we all look forward to hosting you all again very soon! We\'ve vacationed in Seaside since the beginning so we\'re talking decades of rentals. We\'ve had extended family vacations in large units before but none have been like Bella Waves! The layout was exceptional, giving everyone choice about rooms in proximity or options for more privacy. The second floor main living area was amazing: incredibly spacious, large family friendly cooking and dining, front and back balconies, and access to the lounging pool. Did I mention the elevator?! Luggage to the third floor? No worries. Tired at the end of the day? No worries. Beautiful decor and attention to detail are the caliber of a fine home. Your kids will be at the beach in 60 seconds even if it takes you a leisurely two minutes. Literally across the street from wonderful dining choices. And it has it\'s own parking lot! 3, 4, 5 cars? They fit and are open for you even when the surrounding commercial spaces are overflowing. I can\'t say enough about our wonderful family vacation at Bella Waves. 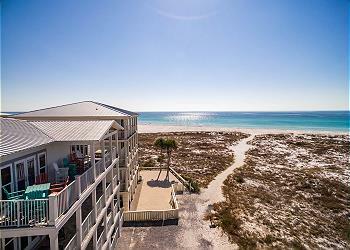 We are so thrilled you chose to venture out to Grayton Beach and to Bella Waves. This beautiful home is truly everything you said and more. It is the perfect place for a beach getaway. We look forward to having you back soon! We had the best time in this house! My husband and I got married in Grayton and we housed the wedding party in the house. It was spacious, clean, had all the amenities we needed, and the host even left us a sweet gift for booking with them! We are planning on making this an annual trip! Highly recommended! What a beautiful photo! You really captured the gorgeous views from this home! We are absolutely delighted that you enjoyed your stay with us and this property so much! Thank you so much for choosing 360 Blue for such a special trip! We look forward to helping you plan your next visit with us!